One of the icons and a cross floating in zero gravity on the ISS. Credit: Roscosmos. The Gospels, four icons, crosses and a relic of the True Cross have been taken aboard the Russian segment of the International Space Station (ISS), a Russian cosmonaut has reported. A photo taken by the station crew shows an icon and a crucifix floating in zero gravity in the ISS. Writing on his blog at the website of the Russian Federal Space Agency (Roscosmos), Cosmonaut Maksim Suraev responded to readers’ questions about religious symbols on the space station. “We have four holy icons on the Russia segment. We also have the Gospels and a big cross,” he said, according to a blog entry translated by Russia Today in November 2009. Russia Today reported that the Lord’s Divine Cross was given to A.N. Merminov, the head of Roscosmos, by the late Patriarch of Moscow Aleksy II. 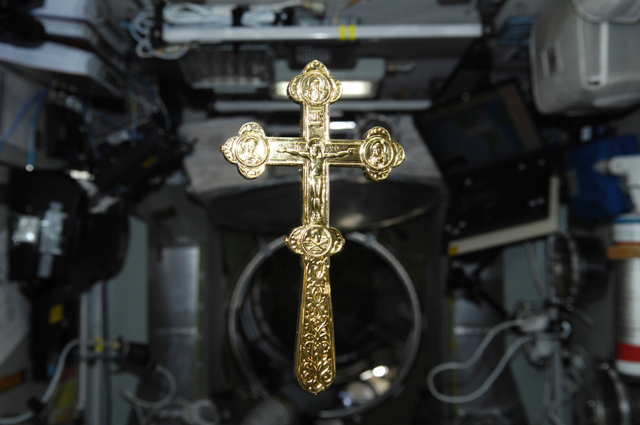 The cross was delivered to the station in 2006 by the crew of Soyuz TMA-8. Suraev added that he has a reliquary cross in his cabin. He added that his cross was blessed in the major monastery of Sergiev Posad. “It will be with me the whole expedition and will return with me to Earth,” the cosmonaut wrote. Holy relics and other objects have been on previous spaceflights. U.S. astronaut Ronald Garan brought a relic of St. Therese of Lisieux with him on the space shuttle Discovery in 2008. He plans to bring another relic of the saint with him on a mission to the ISS in 2011. Article published in English on: 26-2-2010.